Providing you the best range of smoke curtain with effective & timely delivery. Smoke Curtain prevents the movement of smoke and heat from one area to another in a fire by channeling or containing the smoke and heat. Smoke curtains are well suited to most industrial and commercial buildings as they are unobtrusive, moving to their active position only when needed. 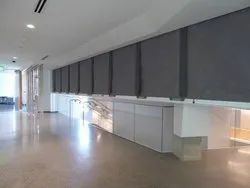 Smoke Curtain can be made capable of operation as an integrated part of smoke control and fire management scheme, with emergency power units and the facility to interface directly with a fire control panel. The system is fully protected and fail-safe to avoid the need for fire-rated cabling, with a 30 minute time delay to maintain units in the raised position in the event of a temporary interruption to the power supply. If power is not returned, units will descend to the down/default position after a time lapse. With the G (Gravity) version smoke curtain, the curtain falls under gravity in a controlled manner to a predetermined level either on receipt of a signal or on the loss of power. With the D (Drive) version smoke curtain, the curtain drives down in a controlled manner to a predetermined level on receipt of a signal. The smoke curtain can also be driven down to an intermediate position, for instance over an escalator, where it is held at that position for some time before descending further.